That's right, it seems that Sony is working on a smartphone called Pikachu, the most famous Pokémon in the well-known video game franchise. But many will wonder: why that name for a smartphone? Maybe it's just a code name without further explanation. After all, by name may be of interest only to fans of the game (which are not few). Be that as it may, a test in GFXBench has served as a public leak of the technical specifications and we disclose them below. 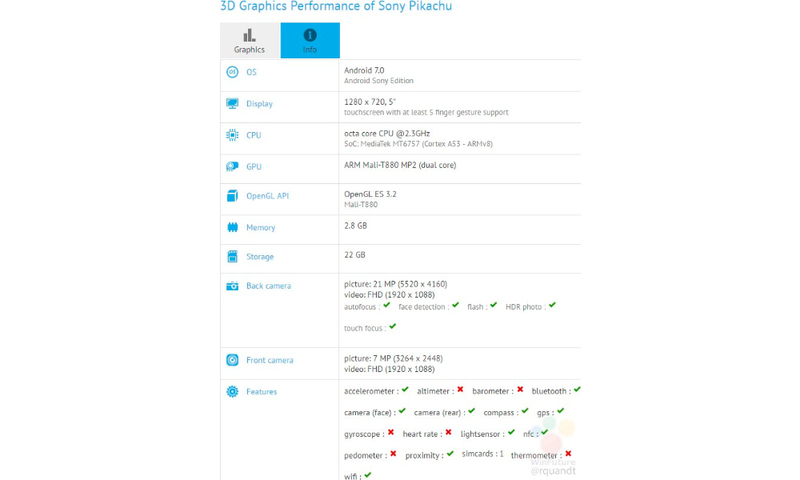 Thanks to the usual tests carried out at GFXBench, this time leaked by leaker Roland Quandt, we can see that the features of the new Sony Pikachu are very similar to those of the impending Sony Xperia XA2, and some say that it is the same device. In any case, we speak of a 5-inch display with HD resolution (1280 x 720 pixels) and an octa-core processor MediaTek Helio P20 at 2.3 GHz, supported by 3 GB of RAM and 32 GB of internal memory. But the most interesting detail may be, due to its size, the rear camera of 21 megapixels and the front camera with a resolution of 8 megapixels, along with the Android Nougat operating system. This device must also sopport WiFi networks, GPS, NFC, accelerometer and light sensor. By contrast, it would not have a gyroscope (and it is unknown if it will have LTE connectivity). The leaked rumors, therefore, provide a wealth of information about Sony's new smartphone, except the real mystery of the news: why the name Pikachu? Many people think in a very characteristic design. Who knows, maybe it is inspired by the famous character of the Pokémon series. In the absence of more info, all these questions should wait a few more days to be resolved. As soon as possible, the day of the official presentation of the device, which could be given during the event dedicated to Sony at the Mobile World Congress 2017, scheduled in a few days in Barcelona.